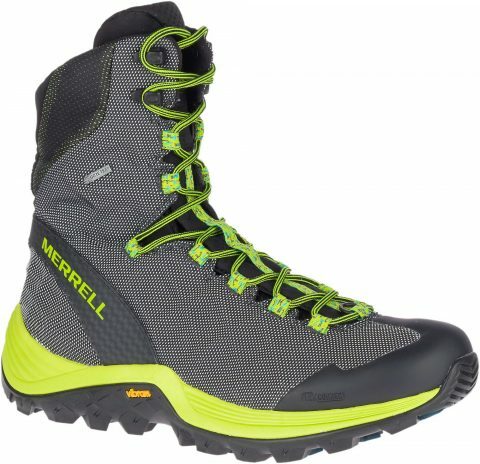 Finding footwear that keeps your feet warm and dry in the snow AND provide plenty of grip and snow and ice can be tricky, but with the Thermo Rogue Mid-Gore Tex winter boot, Merrell have delivered the answer. The Thermo Rogue range was an award winner at the ISPO outdoor trade show and features exclusive Arctic Grip Dura from traction experts, Vibram, which is their most advanced cold weather gripping system ever created. Combining insulation, water resistance and a sole engineered to give stability on wet ice, snow and slush, the Thermo Rogue is the perfect choice for après-ski activities and winter walks. The boots are also packed with protective features like a rubber toe cap and a bellows tongue, the athletic two-season hybrid boot remains stripped of any bulk. Wearers can move fast on any adventure, confident in the grip and traction of their shoes. The Kinetic Fit™ BASE insole is also contoured like your foot and provides flexible, intuitive support for connected and protected movement. The Thermo Rogue range is stocked on SportsShoes.com now from £179.99.